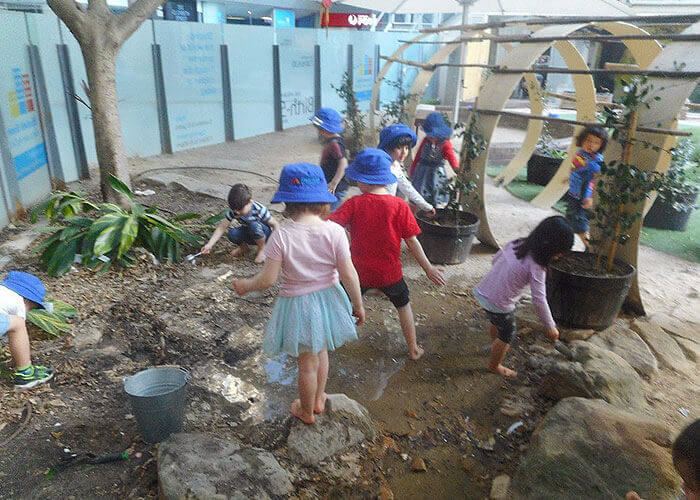 An outdoor oasis can be a hard thing to find in the CBD, but step into Elizabeth Street Early Learning Centre and you’ll find a sunny outdoor area filled with children exploring, playing and learning. Centre Manager, Jessie Mar-Lavulo calls the space an “outdoor wonderland” that offers many opportunities and “potential for children’s learning” which is used on a daily basis – regardless of the weather. 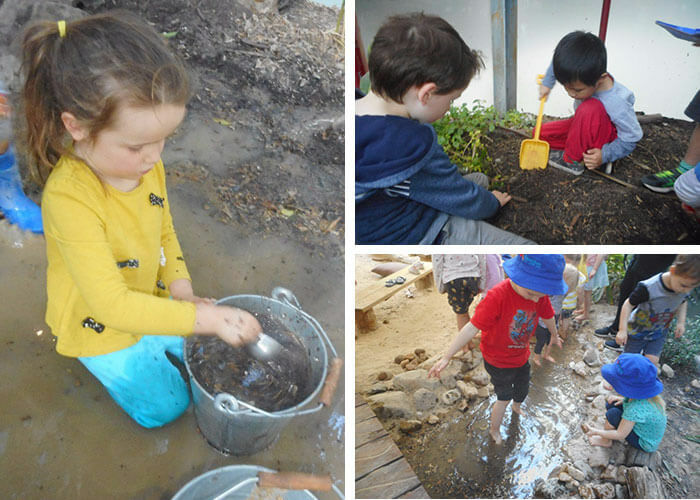 “During rainy days the children use the centre’s gumboots, umbrellas and rain coats to experience jumping and splashing in the puddles outdoors. They experience the rain on their faces, their hands and even sometimes on their feet,” comments Jessie. This kind of experience that enables children to explore sounds, textures, temperatures and sensations as well as embark on a range of discussions and explorations from talks about the weather to understanding cause and effect (‘what happens when I jump in a puddle?’). In the summer months children enjoy their play in our outdoor river area with the water pump. “They also grow and harvest herbs from their gardens for meal preparation with the cook,” remarks Jessie. Sustainability plays a big part in the centre and the children are active participants in this. There are two children from the centre’s Preschool room who have taken on the role of Sustainability Champions where they work with the educators to ensure sustainability practices are happening. Children also use rainwater to water the indoor and outdoor plants and also actively feed the worms in the worm garden. Through this experience, children were working together with the support of educators and developing their empathy and social skills. The children are also using the environment as third teacher and connecting with nature at the same time. From play that could seem like simple play, there is actually a lot of significant learning occurring. Through this experience, Ishana was igniting her curiosity and interest in counting, sorting, grouping and logical reasoning skills as she carefully places the pebbles and the different natural objects, making great use of the open space provided to her. Another example of learning in the outdoor space is when one of the centre’s children, Elsie displayed a lot of interest towards the water play. She helped the educators to fill the river using the pump and water tap and began exploring the water using her feet noting “it’s cold” as she was walking through the creek. With a team of friendly and trustworthy educators and plenty of resources to ignite children’s curiosity, Elizabeth Street Early Learning Centre is a wonderful place for children to grow and develop. To learn more about this childcare centre in the CBD or to book yourself in for a tour, head here.